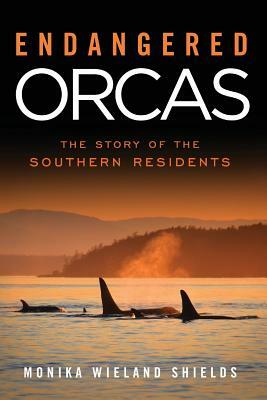 This afternoon Jeanne and I had an amazing encounter with a couple of transients. As I've mentioned before, it's not often you get to see the marine mammal feeding transients from shore. Today, however, was a giant exception. We heard there was a group of 6-8 Ts heading north along San Juan Island. We "whale chased" them along the west side and saw them from several different areas, but by far the most amazing encounter was right in Jeanne's front yard. Two of the transients - a male and a female - started swimming right at us sitting on the rocks. They came within 100 yards of shore when they began to circle, usually a sign they're on to some prey. Sure enough, a little harbor seal head popped up right between them. 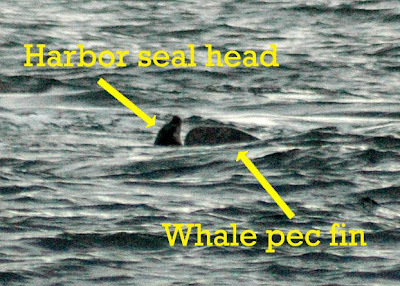 We could see the seal for only a couple of seconds before the whales circled once more. The seal was gone, and the whales continued on their way, all in a matter of minutes. Even though there wasn't *that* much to see, it left the adrenaline pumping and both of us in total awe of what had just happened! I'm sure I'll be able to figure out which two whales it was once I look at an ID guide, especially since the female had a very distinct notch at the base of her fin. 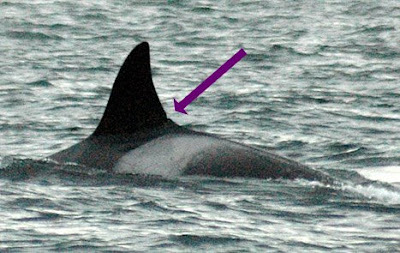 From what I gather of which transients were there, the male was likely T30A.